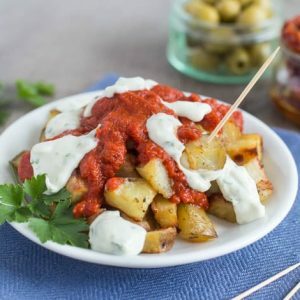 Patatas bravas is a Spanish dish, and it’s always something I gravitate towards when I go out for tapas – which admittedly isn’t often, but it should be. This stuff is good. If you’re not aware, patatas bravas is basically crispy potatoes served in a spicy tomato sauce… which kind of sounds a bit boring. But trust me, it’s amazing. 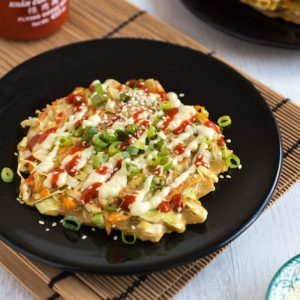 As usual, when preparing for this recipe, I read about twenty different patatas bravas recipes online – and as usual, I realised that everyone has a different way of doing it. So this is my own way. The easy way! But despite cutting a few corners, I ended up with crispy potatoes, a rich and spicy tomato sauce, and creamy garlic aioli to drizzle on top. Which I view as a pretty good result. The potatoes in patatas bravas are often boiled and then deep fried, but that sounded far too labour-intensive for my liking, so I roasted them instead. They still end up nice and crispy, and fluffy in the middle, but with much less effort involved (and much less washing up to do afterwards). To make the spicy tomato sauce, I blended up a red pepper with a tin of tomatoes and a few spices, then simmered it until it became thick and rich. Of course I used my favourite Cirio tomatoes – I guarantee that the cheapy supermarket own brand tomatoes won’t give a sauce that’s anywhere near as tasty. The Cirio tinned tomatoes are infinitely richer and more tomatoey, if that makes any sense. Using great quality tomatoes means that you can get away with a really simple recipe – you don’t need to add tons of other ingredients to get a tasty sauce. Of course… a drizzle of garlic aioli is always welcome, whether you’ve got a super tasty tomato sauce or not. As you might expect, I cheated, and didn’t make mine from scratch – I just flavoured some mayonnaise with garlic and fresh parsley. Simples. 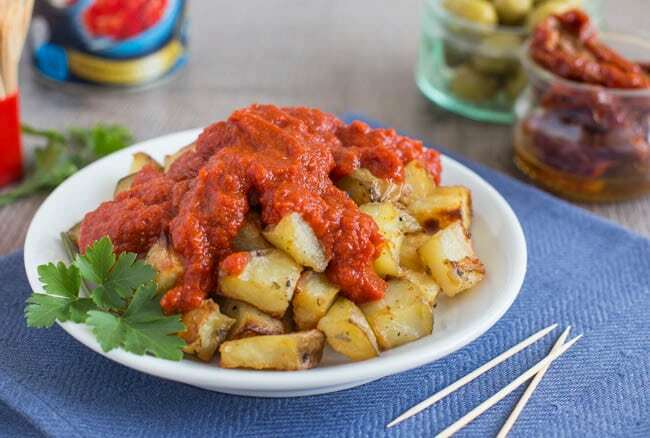 Patatas bravas is sometimes served with the tomato sauce mixed through the potatoes, rather than just spooned on top. Both ways are equally delicious, but I personally enjoy serving it up neatly and then making a mess of it on my own. You could serve these patatas bravas as a side dish, or tapas-style, with a few cocktail sticks for poking! 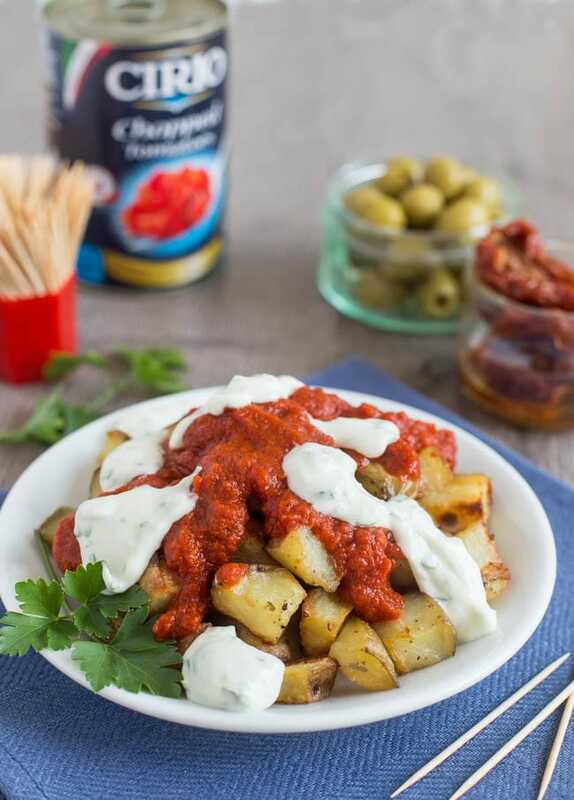 If you like the sound of this easy patatas bravas recipe, just grab yourself a couple of potatoes, a tin of Cirio tomatoes, and a jar of mayo, and you’re most of the way there. Cut the potatoes into 2cm dice, and toss with some oil and plenty of salt and pepper. 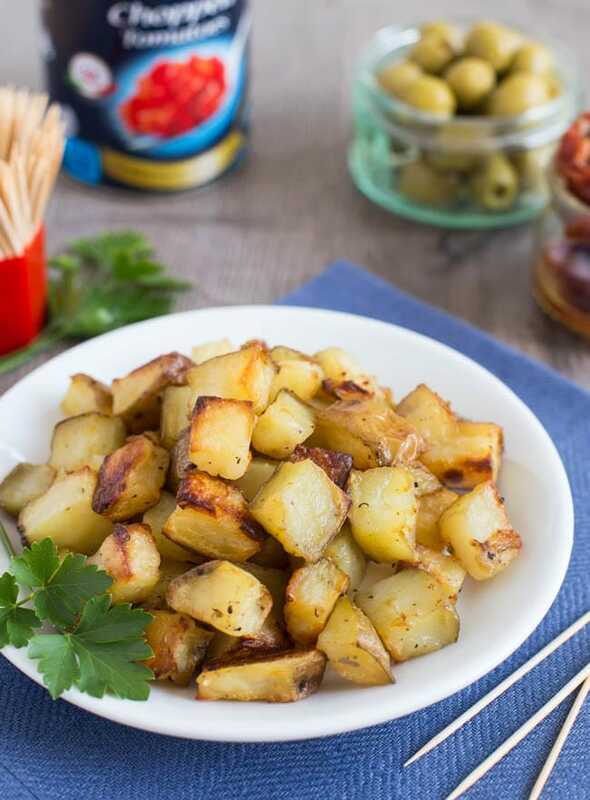 Spread in a single layer on a baking tray, and roast for around 45 minutes at 190°C (Gas Mark 5 / 375°F), or until the potatoes are soft in the middle and crispy on the outside. While the potatoes are roasting, make the tomato sauce. Add all of the sauce ingredients to a blender, and blend until smooth. Transfer the mixture to a pan, and place over a medium heat. Bring to a gentle simmer, and cook for around 15 minutes, until the mixture has thickened to your desired consistency. To make the garlic aioli, add the garlic to a mini food processor with the fresh parsley. Blitz until finely chopped. Add the mayonnaise and a dash of milk, and blitz again. When the potatoes are cooked, serve them topped with the tomato sauce and garlic aioli. 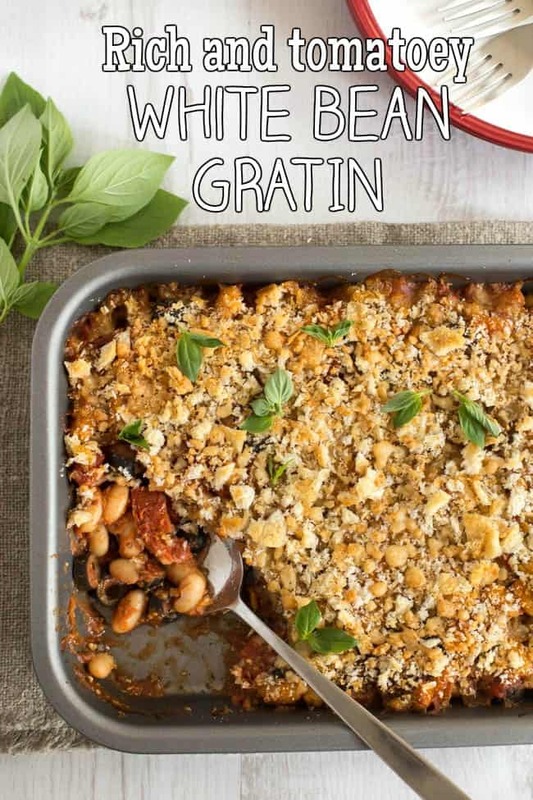 Cirio tomatoes are also perfect in this rich and tomatoey white bean gratin – one of my favourite recipes so far this year! I’ve never had this before so I might try it out! It looks delicious! This is bringing back happy memories of Barcelona for me. We always make this for our tapas nights too. Barcelona is one of my favourite cities in the world! I will be trying this recipe out once I have the ingredients. Sounds delicious. Do it, it’s so easy! 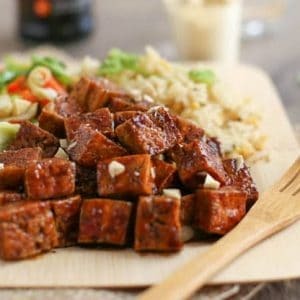 These looks so delicious! 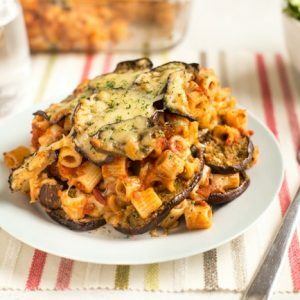 I make a lovely spicy tomato sauce but never thought of making this with it! I’ll need to try it! 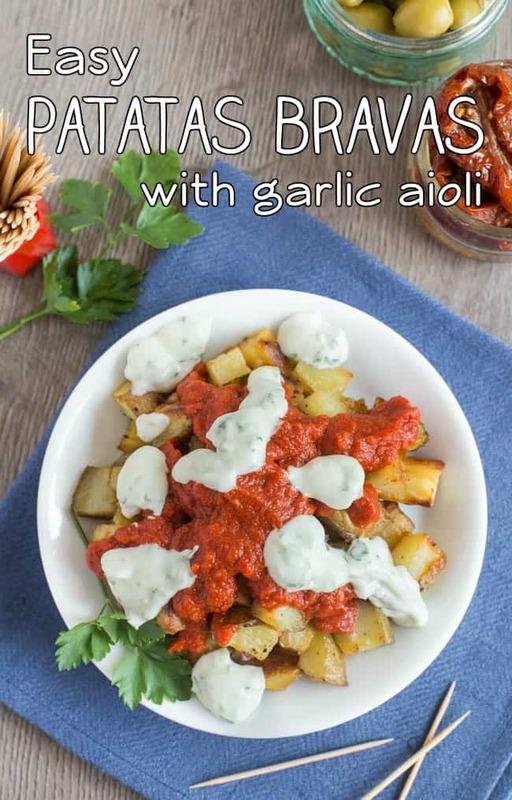 Mmmmm, patatas bravas – si, si , si! One of my favourite tapas dishes and yours look fantastic! Don’t think I have ever had a dish like this but now I definitely want too!! This is one of my favourite dishes! 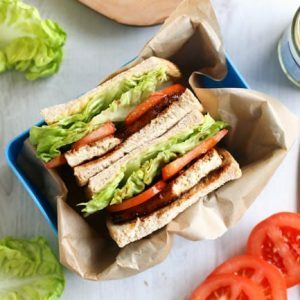 I never make it myself though – this looks great though so I should try! 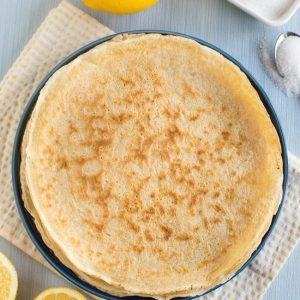 Definitely, I love recreating my favourite dishes at home – and they’re usually easier than I expect! Oh yum! This looks like an amazing dish. 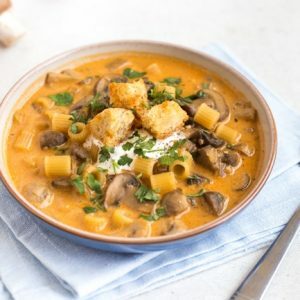 Both the sauce and the garlic aoili sound really nice and they’re easy enough for me to make. I love batata bravas , I ate this almost every day when I was on holiday on the canary island. Haha this would be a great way to get through all your aioli! Yum! 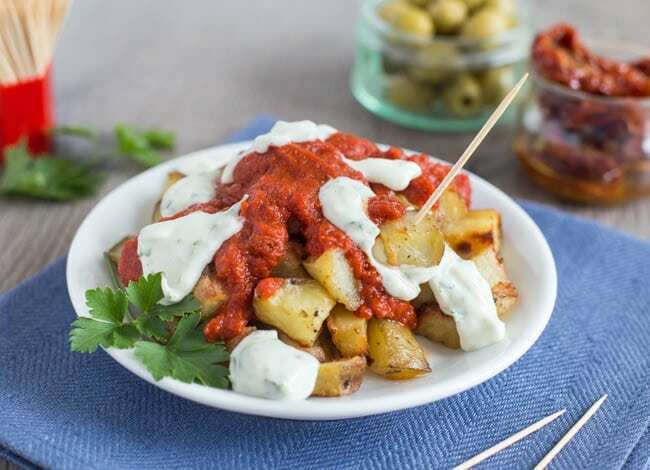 I love patatas bravas and this simplified version is perfect! I need to look out for those Cirio tomatoes. The aioli sounds wonderful! I’ve never had patatas bravas! I love Patatas Bravas, I’ve always found it interesting how there seems to be a bit of a divide in Spain about how it’s done. In Seville I encountered something similar to this and yet Barcelona, Valencia and Mallorca have something more akin to a spicy ketchup and aioli on theirs. I wonder if it is a north south divide? This looks sooooooo good. I love the smokey tomato sauce piled on top, too. Gorgeous. I’d be perfectly satisfied with this dish. Nicely done. I have never heard of this dish…it looks amazing with the spices and potatoes. I’ve never heard of this but it sounds delicious! Potatoes and tomato sauce and aioli together sound amazing. Heck YES. That needs to be in my belly!!! 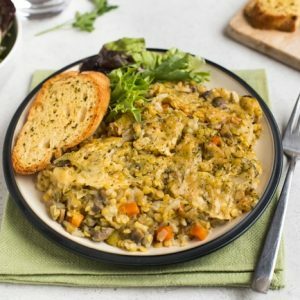 I’ve had this dish before, but never made it. Guess that will have to change! Anything that is made with potatoes is NEVER boring! That’s the Scottish part of me talking, but the Italian part loves the tomatoes, too! Patatas bravas is one of my favorite dishes. I could eat a plate of of your version it looks delicious. 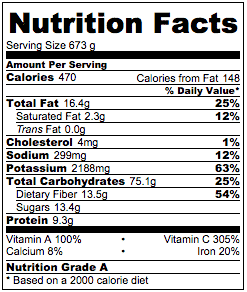 In what way are the Cirio tomatoes better than other brands / supermarket own-brands? Just want to make sure I’m not wasting my money if I switch to the expensive ones!